This past month has been huge month for us as we moved house and Adam started a new job. There was also supposed to be a quick trip to Fiji but unfortunately we had to cancel because it was going to be thunderstorming the entire time we planned to be there! We ended up holidaying at home, and filled the week with shopping, movies, massages, swims and a trip to Bounce (an indoor trampoline centre) which was fun but also not so much fun when I woke up the next day with a sore back and aching legs. Our new house is wonderful and has a crazy good kitchen which I have loved using! While I’m sure the novelty will wear off at some point, for now I’m enjoying cooking all three meals every day at home. And there have been so delicious eats let me tell you. I’m very excited to share some new recipes over the next month! 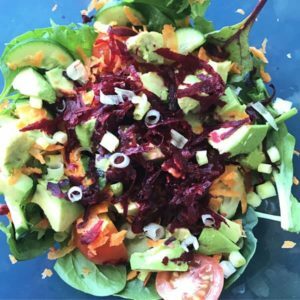 Rainbow Balsamic Salad – I have eaten this salad about 4 times a week for the past month. I can’t get enough of it! PiperWai Deodorant – I developed a rash a short while ago using PiperWai so I stopped for a few weeks. I read that it is important to stir it regularly to ensure the ingredients don’t separate too much and therefore cause irritation. Since I have started using again and stirring it regularly I have not had any issues, which is great because I love this product. ALSO – this morning I dropped its glass jar off my bathroom counter and it bounced a few times and didn’t break!!! So add indestructible to the list also! Piperwai have offered my readers 15% off their first order. Last Week Tonight – THANK GOD John Oliver is back on our screens! Monday nights can’t come quick enough in our house. Baskets – Loving season two so far. Zach Galifanakis’s Chip cracks me up but my favourite character is probably Martha. Anyone with me? Lion – If you haven’t seen this movie yet, run, don’t walk to the cinema and watch it right now!!! It is absolutely incredible that it is based on a true story and the acting is perfect. One of the most beautiful movies I’ve ever seen and I was ugly crying throughout. Hacksaw Ridge – This is another wonderful movie based on an incredible true story. Happy to see Mel Gibson giving plenty of roles to our Aussie actors! A very sad and significant time in our history and Mel has done an excellent job in recreating it. Manhattan by the Sea – After giggling my way through the trailer of this movie I thought I’d give it a go and see what the hype was about. Well, it completely took me by surprise and haunted me for quite a few days afterwards. Worth a watch. Congratulations with Chris D’elia – Chris is one of our favourite comedians so naturally we were drawn to his podcast, which is mostly him telling stories about his life or ranting about things that annoy him. If you are a fan, have a listen. If you don’t know who he is, go watch his stand-up “Incorrigible” on Netflix. Missing Richard Simmons – I read an article on this podcast the other day and downloaded the first episode. So fascinating to hear about the life this man led, and then abandoned. Bad 90s dance songs – Because sometimes you just have too, right? I’m ok with it. Small Great Things by Jodi Picoult – This is Jodi’s most recent book and she is by far my favourite author. The story delves into issues of racism in modern day America, which I think we can all agree is definitely a hot topic right now. Very well written and thought provoking. Awaken the Giant Within by Tony Robbins – I’ve been a Tony Robbins fan since watching “I’m not your guru” on Netflix. The second it ended I went online and searched everything I could on him, listened to every podcast he had, every podcast he featured on of other peoples and read his Money, Master the Game book. I might be late to the party but I’m trying to make up for lost time! And that is my very first What’s Happening done and dusted! I hope you all have a happy, healthy March!